Warning! Read this first, even if you are clever enough to remove all external power before you start to open the PSU. A switched mode power supply contains some large capacitors which can be charged to well over 300 V DC (in countries where 230V mains is common). Normally, when the PSU is functioning properly, these capacitors will loose this voltage rather quick when the power is removed. But this is not a normal situation and therefore the capacitors may not loose this very dangerous voltage fast enough. Special care should be taken to discharge the capacitors (by means of a normal light bulb for instance) before you start touching the PCB all over the place. Do not short the capacitors with a screw driver or something, as the large currents can damage the capacitors. Do NOT operate the PSU while it's open! Not only can this cause a serious electrical shock, it can also cause short circuits, destroying the PSU for ever! Some basic knowledge about electronics and electronic components is mandatory when you intend to fix your PSU. I know, PC Power Supply Units are very cheap. Why not chuck it away when it's dead and put in a new one? Simple because the new one is not always at hand. Or the PSU is a very special model, tailored to this particular brand of computer. What's more, sometimes you can't even get a separate PSU without buying an entire PC case to go with it. So you'd have to throw away at least one of them, which is of course a shame. You see, there are some reasons why one would bother about fixing a PSU yourself. This description is by no means intended to solve all your power supply problems. I only cover a few basic tips so you'll know where to look. If the golden tip is not among them, bad luck, throw it away and buy yourself a new one. One important tip in advance: "Never try to operate the PSU without a load". Most switching mode power supplies expect some load on the regulated output (usually the +5 V on a computer PSU). If you intend to try out the PSU without a computer you can always connect a 12 V car light bulb to the +5 V output as artificial load. Is the main fuse alive? This is a good point to start looking for the problem. If the main fuse is dead, check the main switching component for shorts. Usually the main switching component is a transistor or a FET and can be found on one of the heat sinks on the primary side of the PSU. If it's shorted you're in bad luck. It is very likely that the transistor killed part of the control circuit as well. My best advise is: "Get yourself a new PSU" because it may cost quite a lot of effort to find all the broken parts and get the required new ones from you're local component store. The main fuse is still alive! One or more Electrolytic Capacitors are leaking or have dried out, causing them to loose capacity. Pay particular attention to capacitors with a crack in the tin cap. Furthermore capacitors in close proximity to heat sources are particularly susceptible for loosing their capacity. Use only 105°C capacitors with low ESR as replacements! I've had a 47µo capacitor measuring just 43µF once, which prevented to PSU from starting up! Just to give you an example how critical some designs are. Check all secondary diodes for shorts. Schottky diodes have a typical forward voltage of approximately 0.2V. Normal silicon diodes have a typical forward voltage of about 0.6V. Cold solder joints are also a common cause. They can especially be found around the pins of "warm" components, particularly warm components which are fixed to heat sinks which prevents them from moving when their legs extend due to the heat. Finally the start resistor may have died. I'll explain this is in more detail below. There are probably dozens of other causes why a PSU has died. Don't spend too much time and effort to find it if these tips don't solve your problem though, considering the current prices of new ones. 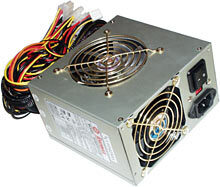 It is quite obvious that a PSU supplies some low voltages on its secondary side. But it also generates at least one voltage on the primary side as well because the control circuit would like to have something to eat too. Usually this voltage is simply derived from an extra coil around the main switching transformer. However the power supply must have a way to get started. When it is switched on, this control voltage is not available yet because the power supply is not operational yet. One popular way to solve this problem is the use of a start resistor. This is a relatively high ohmic resistor (usually in the range between 390kΩ to 680kΩ) which is placed between the 300V DC primary voltage and the control circuit's power supply. 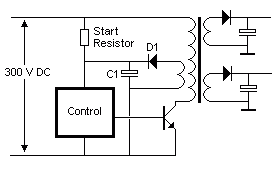 At first the control circuit is switched off completely, drawing next to no current. This allows the high ohmic start resistor to charge the capacitor C1 slowly, but steadily. Once the voltage on this capacitor is high enough to fire up the power supply the control circuit kicks in and gives the first pulses to the switching device. This will cause the control circuit power supply (D1) to deliver enough energy to keep the control circuit going until everything reaches a stable operating condition. Remember that most ATX power supplies are never really switched off. Normally they remain in standby when the computer is not in use. Therefore such a PSU can run forever, even with a dead start resistor. Only when you have removed the power completely you will find that the computer won't start up any more. This is a clear indication that the start resistor has died. The start resistor is usually a normal ½W or ¾W carbon resistor and is always connected to the +300V line on the primary side of the PSU. The resistor in this picture should be 560kΩ, but measured almost 1.2MΩ instead!